Last month, a rumor surfaced that the trailer for Captain America: Civil War will be attached to prints of Star Wars: The Force Awakens, which hits theaters on December 18. That report was never confirmed by Disney or Marvel, and it wasn't known if the first trailer would arrive online earlier than Star Wars: The Force Awakens' release on December 18. Earlier today, Jimmy Kimmel announced that Chris Evans (Captain America) and Robert Downey Jr. (Iron Man) will be appearing on tonight's episode of Jimmy Kimmel Live!, with a "big surprise" from Captain America: Civil War. As many have speculated, that surprise is in fact the first trailer. Set for release in the United States on May 6, 2016, Captain America: Civil War is directed by Anthony Russo and Joe Russo (Marvel's Captain America: The Winter Soldier) from a screenplay by Christopher Markus & Stephen McFeely (Captain America: The Winter Soldier). The film brings back Chris Evans as the iconic Super Hero character Steve Rogers/Captain America along with Robert Downey Jr. as Tony Stark/Iron Man, Scarlett Johansson as Natasha Romanoff/Black Widow, Sebastian Stan as Bucky Barnes/Winter Soldier, Anthony Mackie as Sam Wilson/Falcon, Paul Bettany as The Vision, Jeremy Renner as Clint Barton/Hawkeye, Don Cheadle as Jim Rhodes/War Machine and Elizabeth Olsen as Wanda Maximoff/Scarlet Witch. These heroes will be joined by a number of new characters and returning supporting characters as well. After his debut in Marvel's Ant-Man, Paul Rudd will make his first appearance alongside the Avengers as Scott Lang/Ant-Man in Captain America: Civil War. The film also includes outstanding additional cast members, including Chadwick Boseman as T'Challa/Black Panther, Emily VanCamp as Sharon Carter/Agent 13, Daniel Brühl, Frank Grillo as Brock Rumlow/Crossbones, William Hurt as General Thaddeus "Thunderbolt" Ross and Martin Freeman. Marvel's Captain America: Civil War is produced by Marvel Studios' president, Kevin Feige, with Louis D'Esposito, Alan Fine, Victoria Alonso, Patricia Whitcher, Nate Moore and Stan Lee serving as executive producers. Captain America: Civil War will kick off the Marvel Phase Three slate, which is jam-packed with 10 highly-anticipated movies. Following Captain America: Civil War is Doctor Strange, which is currently in production and set for release on November 4, 2016. Guardians of the Galaxy Vol. 2 will start filming early next year, arriving in theaters on May 5, 2017, followed by Thor: Ragnarok on November 3, 2017. Black Panther hits theaters on February 16, 2018, followed by Avengers: Infinity War Part I on May 3, 2018 and Ant-Man and the Wasp on July 6, 2018. Rounding out this Phase is Captain Marvel (March 8, 2019), Avengers: Infinity War - Part II (May 3, 2019) and Inhumans (July 12, 2019). 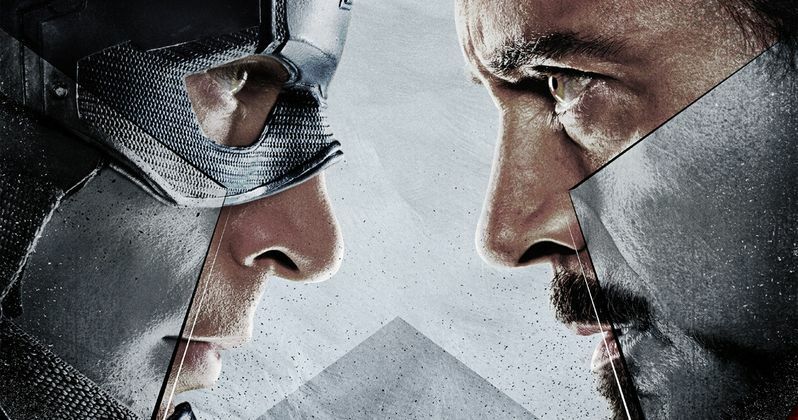 Take a look at the new trailer below, and stay tuned for more on Captain America: Civil War and the rest of the MCU. We also have the first three posters which show two heroes divided.